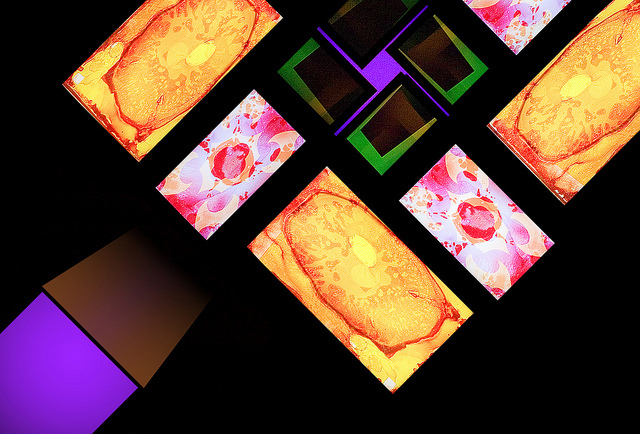 Capturing a work that’s designed to be generative is tricky, so think of this as a snapshot. Image (CC-BY) Dominic Alves. See the full set. Brian Eno’s ‘visual music’ paintings, 77 Million Paintings, are streaming live by way of a Berlin startup broadcaster called ikonoTV. That, in turn, makes a good excuse on a surprisingly-wintry Friday here in New York to mention the work, an exploration of generative software as art and digital paintings as musical composition. The stream is pretty Apple-centric – officially, iPad, iPhone, iPod, and Safari for Mac support it – but I believe previous experiences with Apple’s streaming tech suggest other players may support this format, too. Let us know if you have any luck. ikonoMenasa is delighted to broadcast and stream, for the first time, Brian Eno’s work 77 Million Paintings. The work will be streamed here for 24 hours this Friday (April 1st, 2am GMT) only and broadcast on ikonomenasa via Arabsat, Etisalat and du the first friday of every month, starting April 1st until June 2011. Brian Peter George St.John le Baptiste de la Salle Eno, commonly shortened to Brian Eno, is an English musician, composer, record producer, music theorist, singer and visual artist, best known as one of the principal innovators of ambient music. Conceived by Brian Eno as “visual music”, his latest artwork 77 Million Paintings is a constantly evolving sound and imagescape which continues his exploration into light as an artist’s medium and the aesthetic possibilities of “generative software”. He first created 77 Million Paintings to bring art to the increasing number of flat panel TVs and monitors that often sit darkened and underutilized. The work is a morphing amalgamation of 296 images, overlaid in random sequences and set to Eno’s ambient music. As the title suggests, there are 77 million possible combinations, ensuring every viewer sees something different. The work proves to be meditative, slow and vibrant as it splashes across the screen. More information about Brain Eno can be found here. The images change almost imperceptibly slowly, and are accompanied by low volume music, creating a meditative or hypnotic mood. The work extends the concept also shown in Eno’s interest in Generative Music – combining both controlled and also unpredictable elements into a system. 77 Million Paintings can also be be purchased as software (Mac/Win) which provides a “non-repeating” soundrack together with “randomised” sequences of images equivalent to one screen of the gallery installation. The exhibition was displayed in the splendidly cavernous venue of Fabrica Art Gallery, (the deconsecrated former Holy Trinity Church) as part of the Brighton Festival, May 2010. See also “Brian Eno Speaker Flowers” set, documenting an exhibition that ran concurrently at Marlborough House during the festival. The image has been manipulated to create a “single point” / (one-point) perspective, with the viewer appearing to float in space, directly in front of the centre of the display, as if in an “out of body” experience. Do tell us how the stream works for you. There was a brief outage, but I’m told it’s working now.